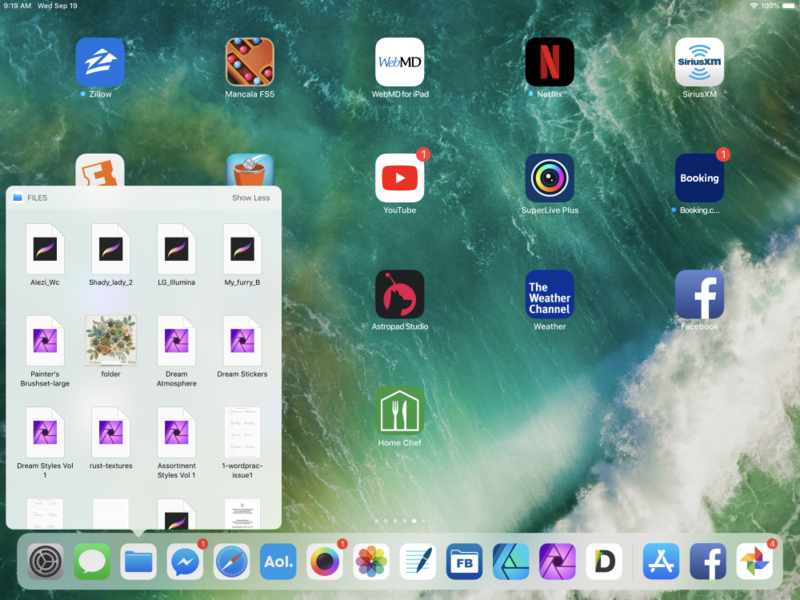 Have you got both Photo and Designer installed on your iPad? That question immediately occurred to me when I first saw this thread, but then I noticed a small clue right at the beginning of the OP. If you do that, what does it show for the file extension & the kind? Ah, yes! So the file type shows as 'document'! 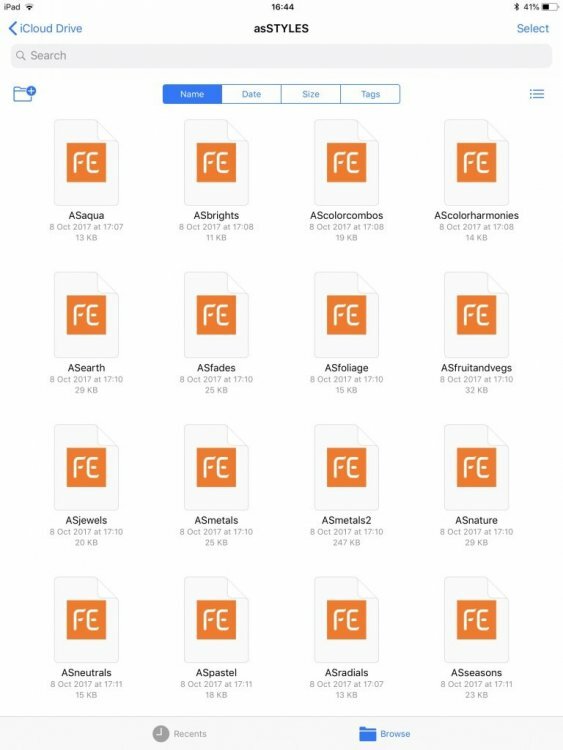 Its interesting because, as I said, I have successfully imported these Styles to my desktop version of AD but when I look at the exact same files on iCloud but on my Mac computer they show as Exec files (photos below) and the info still says they are 'document' but they will load. Can you please send us a screen recording of your process of importing them, please? ... but on my Mac computer they show as Exec files (photos below) and the info still says they are 'document' but they will load. I think "Open with <none>" is normal (because style files have to be imported manually in the app) & on a Mac so is & "Kind: Document" but I don't have any idea why on my Mac the Preview icon is the generic document one & on yours it is the one for a Unix executable file. 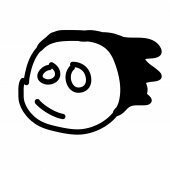 Thank for this. I have logged it with our developers. I had no trouble importing this file into my Affinity iPad apps by tapping on "More..." & the "Save to Files" option just as Carol did. I really don’t want to delete that app, as I do use that quite regularly. Assuming you have a Mac or PC, as a workaround you might try setting up iCloud Drive on it if you have not already done so. 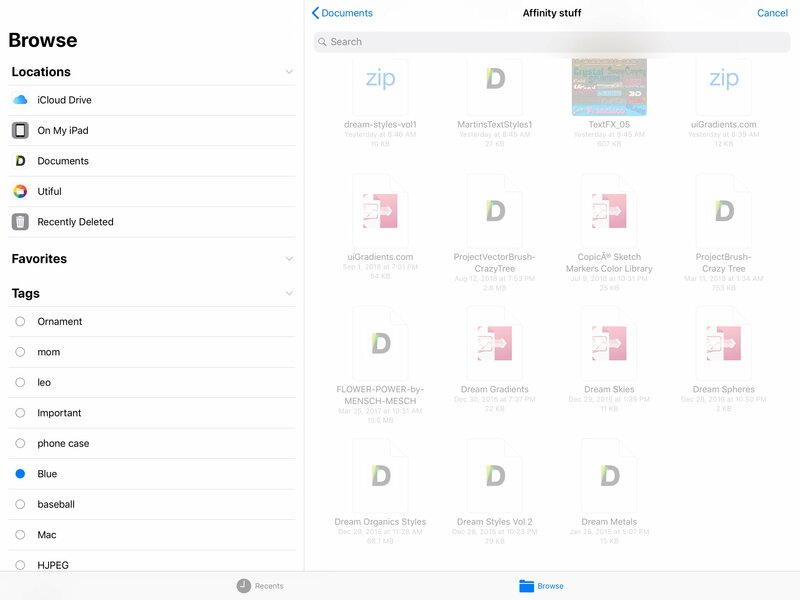 Then on that computer copy one or more .afstyles to one of the iCloud Drive folders accessible in the iPad Files app. Hopefully, in the iPad Files app they will show the Affinity Photo document icon & won't be greyed out when you try to import them into Photo or Designer. If nothing else, this might be a good troubleshooting step to see if bypassing the Mega app (if I am right about the above procedure doing that) makes any difference. 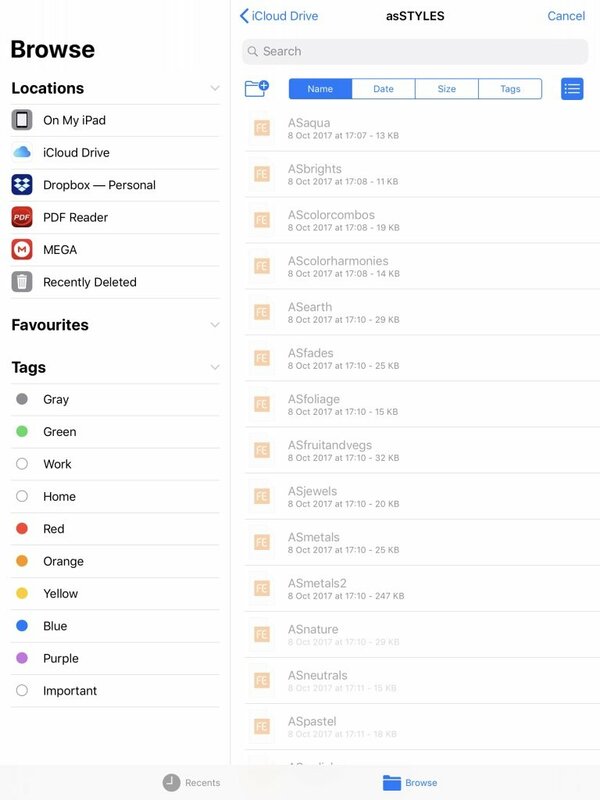 On my iPad i have deleted all the apps associated with downloading files/zip files and now when I download a Styles file the default app is Evernote or the option to save to files on iPad, which saves to iCloud. If I then try and import from there, the file is greyed out and now shows an Evernote logo, even though I didn't ask it to use Evernote to download it! 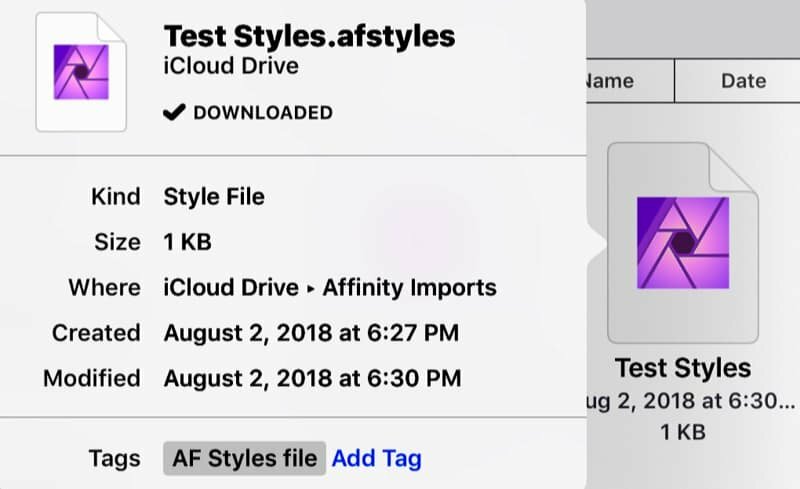 On my desktop, I can download a Styles file and move it across to iCloud. I can then import it to the desktop version of AD or AP without any problems. If I then go to my iPad and try and import the exact same file from iCloud, it is greyed out but doesn't show the Evernote logo. 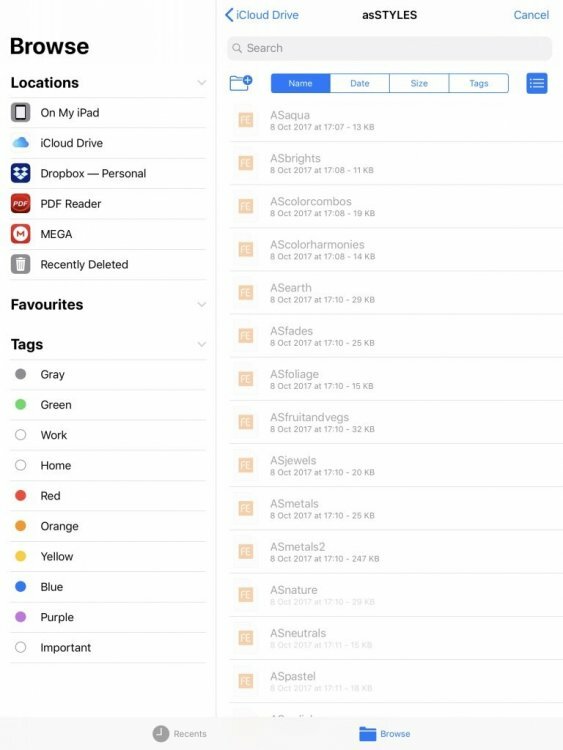 If I then go to my iPad and try and import the exact same file from iCloud, it is greyed out but doesn't show the Evernote logo. What logo does it show? Pretty sure this is the same problem i am having. I downloaded them to Documents, and they are now associated with a file convertor app. None of them have Affinity - Designer or Photo - logos on them despite the extension being correct. I know some fellow users are having the same issue. This is from the Affinity Photo attempt to import Styles. I am having the same exact issues as Tracey ^ . I was able to import Styles with no problem as of a week ago. I no longer have the Affinity thumbnails on my files. 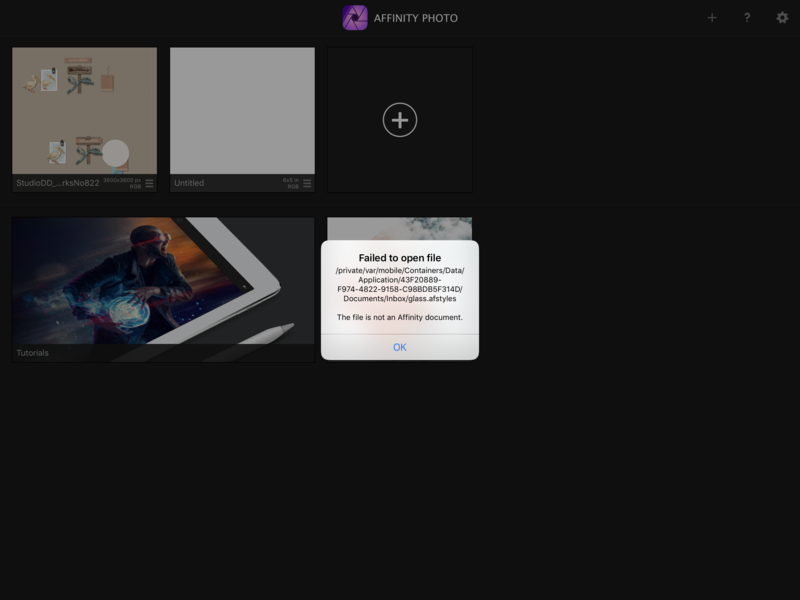 that Carol is referring to, I get the Affinity logo thumbnail but then I get an error when trying to import it to Affinity Photo on my iPad. 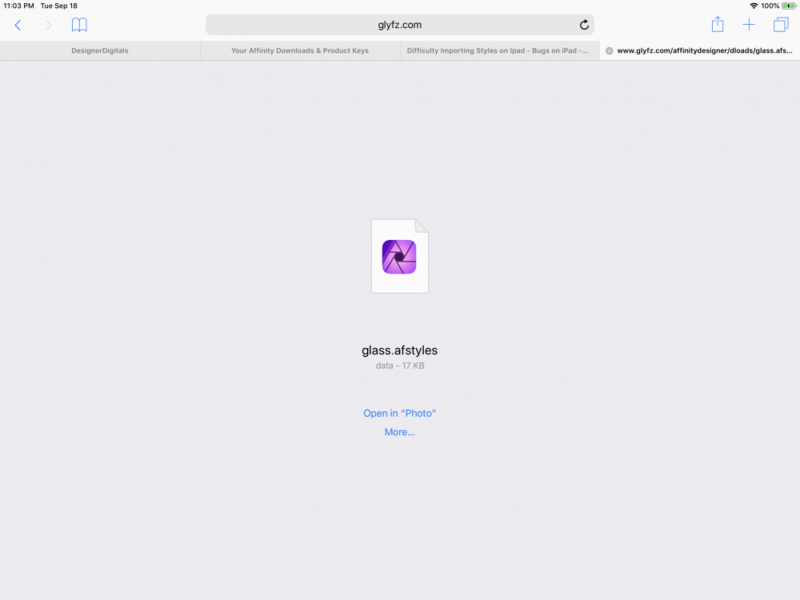 I just successfully added that glass styles above ^ ...... I had to download it to my Dropbox and it work3d perfectly, but not if I tried it from downloading anywhere else. Interesting. When I open Files app and look in Dropbox at those files they are documents.... they only show properly and import when in the import screen in the styles panel. However this morning I realized something. I’d say it was an iOS update issue except that several haven’t updated iOS and have this issue too, so it’s not iOS update issue. When you press and hold on the Files app icon in the bar at the bottom, it shows them properly..... weird . Updates 1.6.11.85 importing Styles works with iCloud and Dropbox but doesn’t work with On My iPad.